Welcome to Week Six of our new series showcasing the world-class Glove Collection of the Worshipful Company of the Glovers of London, cared for and housed here in Bath at the Fashion Museum. 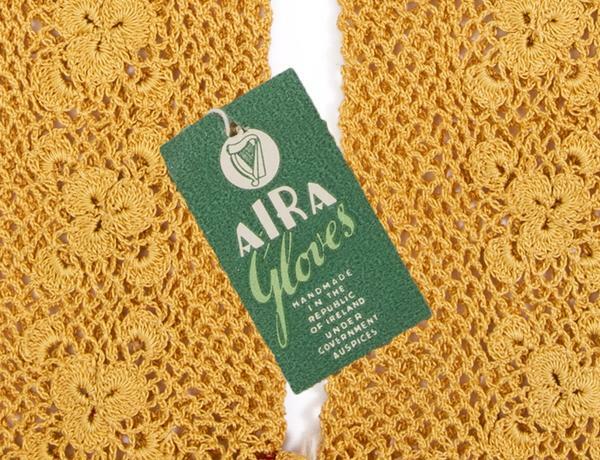 This week we have taken inspiration from St Patrick’s Day and have selected a striking pair of over-the-wrist gold-coloured cotton crochet gloves by Irish glove-maker Aira Gloves. Dating from around 1940-1955, the gloves feature a traditional shamrock motif design on the back and top edge of each hand. 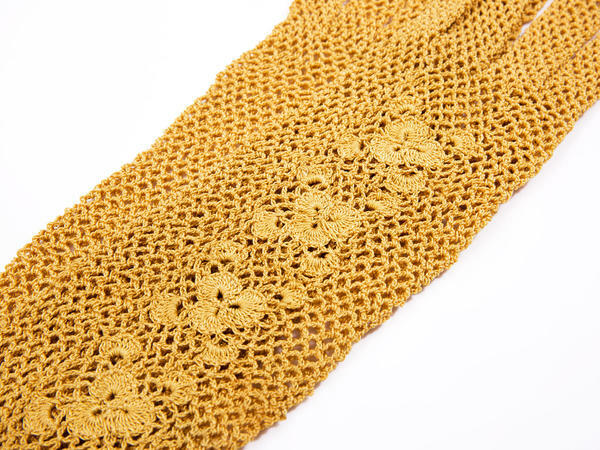 Irish crochet originated in the sixteenth century when nuns in the convent communities developed its distinctive style and technique in imitation of continental lace making. Unlike most forms of crochet, worked in either rounds or rows, traditional Irish crochet is made up of raised motifs that are joined with mesh stitches, forming lace. The motifs usually take the form of solid ribbons, shamrocks, leaves and flowers, with the Irish rose the most recognisable design. 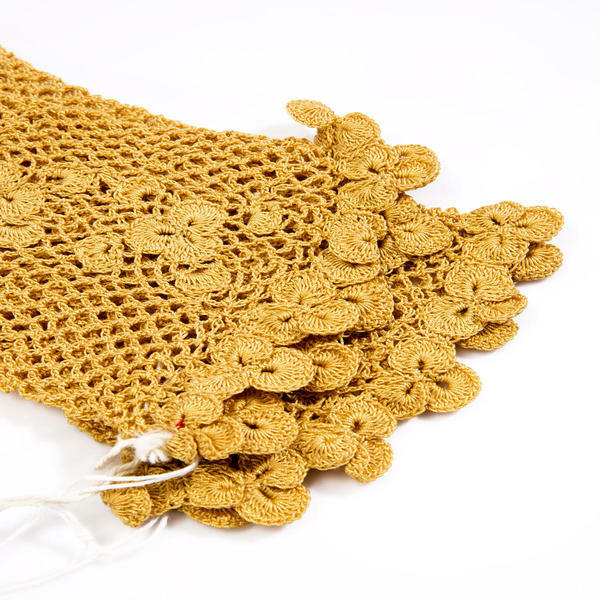 The manufacture of Irish crochet became more widespread during the potato famines of the 1840s. The development of home crafts was encouraged to create some small income for otherwise destitute families and crochet was a simple and easy technique to learn. The intricate and delicate fabric that Irish crochet produced was sought after abroad, so schools were formed to teach the skill and teachers were sent all over Ireland to train others. 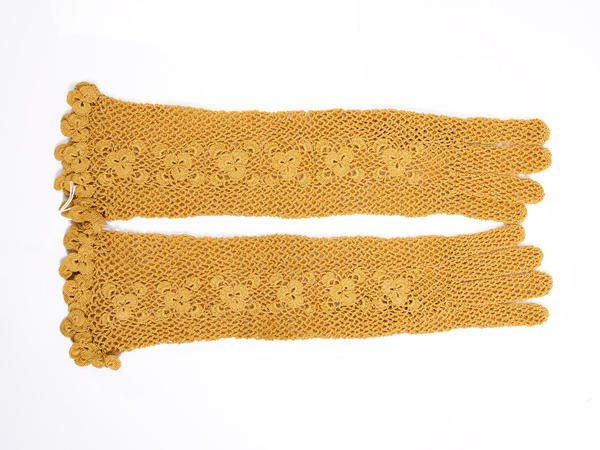 These gold-coloured crochet gloves were made by Aira Gloves of Dublin sometime between 1940 and 1955. While some crochet gloves had always been made in Ireland, there was no organised production on any scale prior to this period. Aira Gloves was one of a number of glove-making firms set up by Jewish émigrés escaping persecution in Europe. Inspired by traditional Irish crochet designs, Aira Gloves mixed them with Austrian glove patterns to create a successful product for export to Britain. The post-war period was a time of high unemployment in Ireland and many men travelled to the UK to find work, leaving wives and children behind in impoverished conditions. Aira Gloves worked with the Irish Government to provide employment for these women and in the 1940s and 1950s there were hundreds of women hand crocheting these and similar fashionable gloves in their homes along the west coast of Ireland. We would love to find out more about Aira Gloves so please do get in touch at [email protected] with any memories and photographs – it would be brilliant to hear from you! 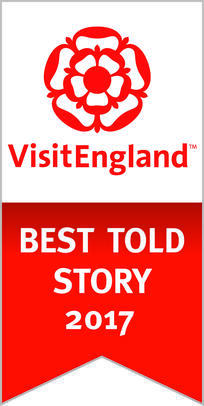 Our new display Glove Stories is on display until 1 March 2020. To celebrate we are highlighting one fabulous pair of gloves from this wonderful collection every week.